When it comes to packing my lunch for work, I start to get bored with turkey sandwiches on wheat bread and salads. I like to mix it up a little, to keep me from spending money going out for lunch all the time. One thing I have found that helps me, is to do some prep work when I get home from the grocery store. This week, I bought a big value pack of 8 chicken breasts. I turned it into chicken salad for my lunch for the week, and dinner on Tuesday night of pineapple chicken over rice. There is nothing I hate more than raw chicken. I disinfect my whole kitchen with bleach every time I have to cut it up on a cutting board. 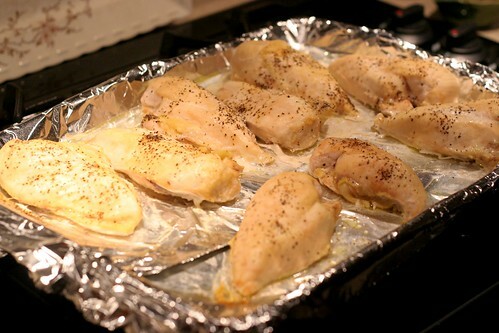 My favorite thing to do with raw chicken: take the breasts right from the pack and onto a baking sheet. I line it with aluminum foil to help with easy clean up, sprinkle the chicken with salt and pepper, then stick the whole thing in the oven at 350 degrees for 30 to 40 minutes, or until the internal temperature reaches 155 -160 degrees. When the chicken is cooled, you can then put it on a large cutting board to cut off the fat and other nasty parts. Dice up the chicken and split it in half. Put the first half of diced chicken in a plastic bag in the fridge for later in the week. Set the second half aside for chicken salad. 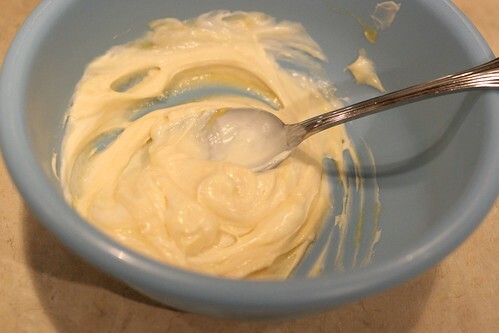 In a mixing bowl, combine mayonnaise and honey mustard. 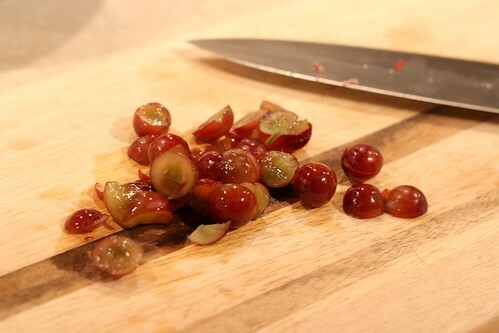 Cut up red grapes into small pieces. They add such a bright sweetness. Now, I realize everyone is funny about their chicken salad. I like mine with grapes, walnuts and celery. Don't run screaming into the woods before you try it. It's so delicious, I even convinced my very skeptical boyfriend who doesn't like anything in his chicken salad but chicken and mayonnaise. Chop up celery into small pieces, and throw them into the mayonnaise mixture with chopped walnuts and grapes. Mix it all together, then add the diced chicken. This will keep in the refrigerator for 3-4 days in a sealed container. Take it to work with some rolls and you have lunch for 4 days! The other half of the chicken comes into use later in the week, on a particularly busy night you can still make a delicious home cooked meal. 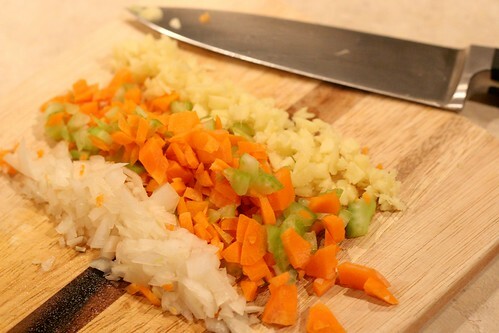 Start by chopping carrots, celery, onion, garlic and fresh ginger. Throw them into a large non-stick skillet over medium heat with oil. 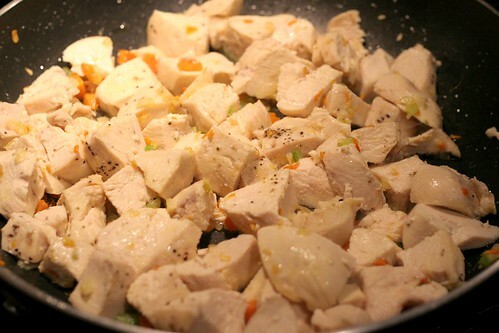 After about 10 minutes, open your bag of cooked chicken and throw it right in the pan. It's wonderful to plan ahead. While the chicken is warming through, it's time to make rice. Here is another tip: 10 minute boil-in-a-bag rice. It saves me every time. Who wants to wait 45 minutes for rice? I always have one box of white and one box of brown in my pantry. Win/win situation. 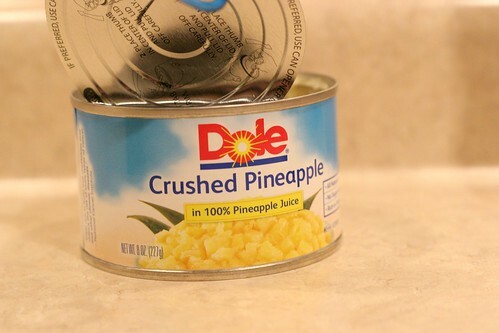 Back to the chicken - open up a can of crushed pineapple in juice and pour the whole thing into the chicken mixture. 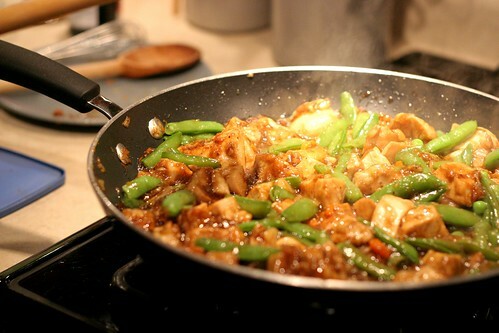 Also add in soy sauce, honey, chili powder, frozen sugar snap peas, salt and pepper. Stir it around as the sauce thickens and the beans warm through. Once it's done, serve a heaping spoonful over warm white rice. It's so delicious - sweet from the pineapple juice and a little spicy from the chili powder. I hope this gives you a good idea to save time during the week! 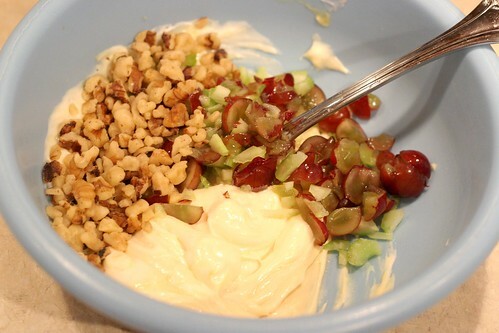 Combine mayonnaise, honey mustard, grapes, walnuts, celery and seasonings in a mixing bowl. Combine. Add chicken and stir. This will keep in the fridge for 3-4 days in a sealed container. 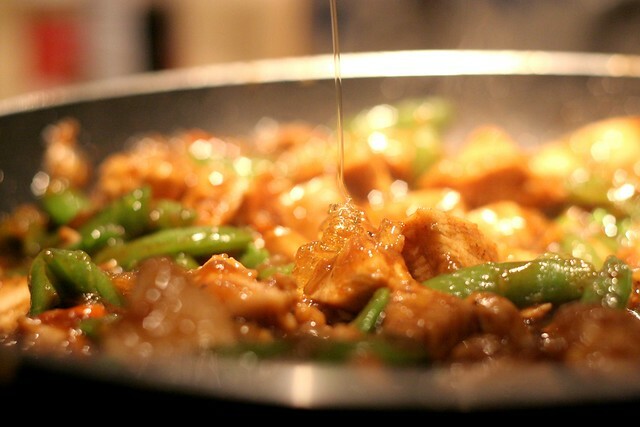 Heat oil in a large non-stick skillet over medium heat. Add all vegetables and stir. Let cook for 10 minutes. 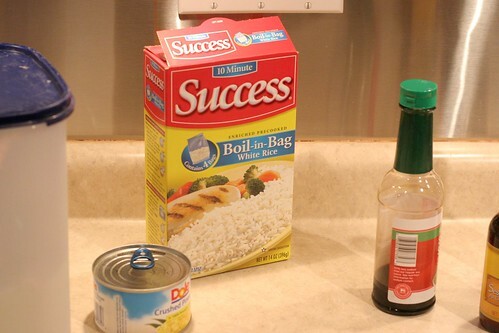 Add cooked chicken and combine. While the chicken is warming, boil rice for 10 minutes. While the rice is cooking, add one can of crushed pineapple to the chicken mixture. Add sugar snap peas. Then add soy sauce, honey, chili powder, salt and pepper. Stir and let cook for 5-7 minutes. Serve over rice. I'm making the pineapple chicken right now! !